Born and raised on the beautiful island of Anguilla, Omari Banks found his musical calling at a young age when he first took the stage in Milan, Italy to sing alongside his father Bankie Banx. 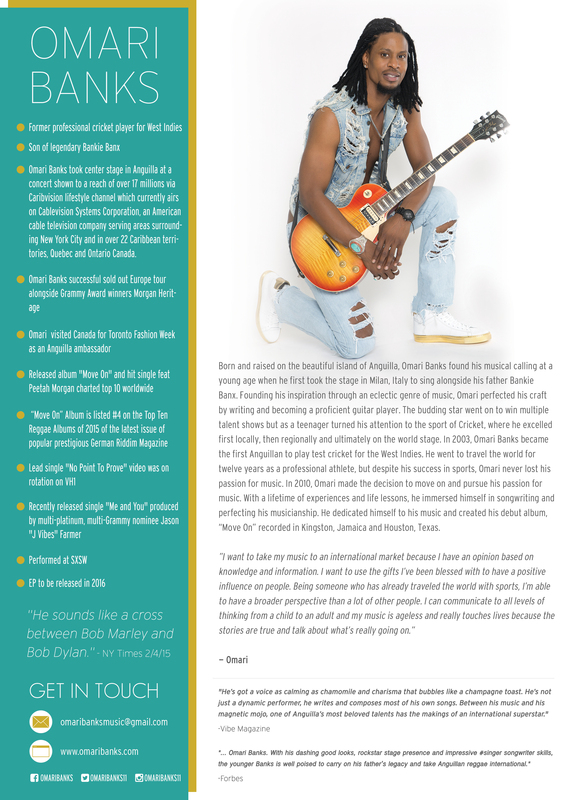 Founding his inspiration through an eclectic genre of music, Omari perfected his craft by writing and becoming a proficient guitar player. The budding star went on to win multiple talent shows but as a teenager turned his attention to the sport of Cricket, where he excelled first locally, then regionally and ultimately on the world stage. In 2003, Omari Banks became the first Anguillan to play test cricket for the West Indies. He went to travel the world for twelve years as a professional athlete, but despite his success in sports, Omari never lost his passion for music. In 2010, Omari made the decision to move on and pursue his passion for music. With a lifetime of experiences and life lessons, he immersed himself in songwriting and perfecting his musicianship. He dedicated himself to his music and created his debut album, “Move On” recorded in Kingston, Jamaica and Houston, Texas. Omari Banks took center stage in Anguilla at a concert shown to a reach of over 17 millions via Caribvision lifestyle channel which currently airs on Cablevision Systems Corporation, an American cable television company serving areas surrounding New York City and in over 22 Caribbean territories, Quebec and Ontario Canada.